According to Wikipedia, ranch dressing was first served by Steve and Gayle Henson in 1954, at their newly opened dude ranch near Santa Barbara, CA. Amazingly, the place was actually called the Hidden Valley Ranch. Steve had apparently developed his ranch dressing recipe in Alaska. Coincidentally, I learned to make cole slaw in Alaska. Despite popular perceptions, Alaska gets plenty warm in the summer (warmer every year, actually, but don't get me started). At the adventure lodge where I worked, we served a lunch of chili, corn bread, and cole slaw to several hundred people each week. The cole slaw we made was flavored with a touch of citrus, and some powdered ranch dressing mix. The ranch flavoring added something subtle and amazing to the cole slaw... and I don't think I ever served it without several people asking for the recipe (as well as the corn bread and chili recipes!). But I never liked using the ranch dressing packets. It seemed kind of cheesy and unauthentic. Since I'm always on the lookout for ways to avoid processed foods and hidden gluten-filled ingredients, I began looking into what, exactly, made up the uniquely addicting flavor of ranch dressing. For ranch-style cole slaw, I find that a little citrus flavor makes for a wonderful tang, and including carrots along with your cabbage provides some sweetness to complement the requisite salt. 2 large basil leaves, sliced thin (chiffonade). Slice up your cabbage. Peel the outside leaves off, and then cut the cabbage head in half from the top down. Cut each half into another half (making quarters), again by slicing from the top of the cabbage head down through the stem. Once you have quarters, it's a simple matter to remove the stem from each section. Turn quarters so the rounded outside surface is facing you, and slice the cabbage thinly into 1/8 inch strips. NOTE: If you're not multiplying this recipe, stick the unused cabbage quarters into a Ziploc, and store them in the fridge for up to two weeks. If you are multiplying this recipe and need at least two heads of cabbage to do so, I recommend using both red and green cabbage for more visual interest. Peel and grate your carrots. You can use a regular old hand grater, or a food processor if you're making a bunch. 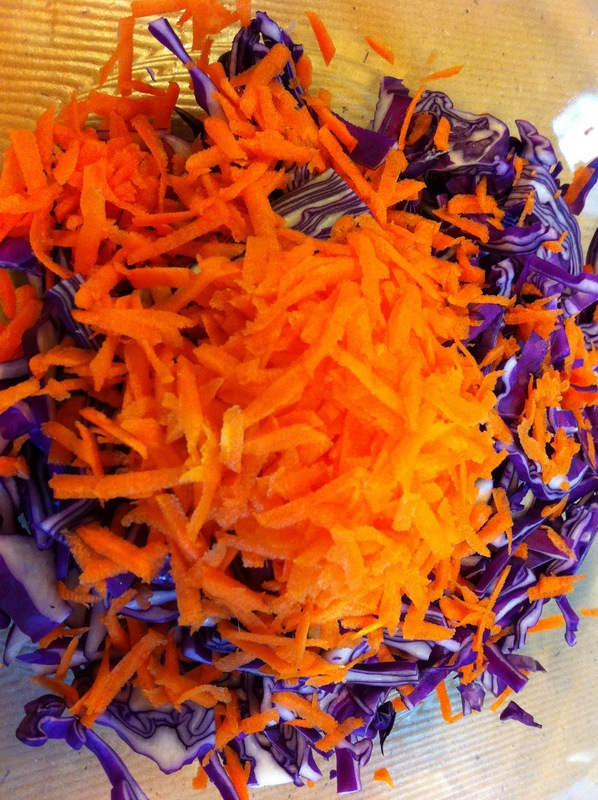 Toss your cabbage and carrots together, and add in the mayonnaise, pepper, garlic, orange juice, and salt. Mix thoroughly, and then chiffonade your basil and add it with a squirt of lemon juice. Mix things around. Taste your cole slaw to make sure all is well. It should burst with flavor, and make your mouth water for more. If it doesn't, add small bits of lemon juice, salt, and orange juice until it does. Made this today to go with slow cooker pulled pork sandwiches. Splendid. And so easy. Bye the way I showed my nieces your pop corn recipe at Christmas. They loved it. Sounds like the cole slaw had a right proper accompaniment... sounds tasty!